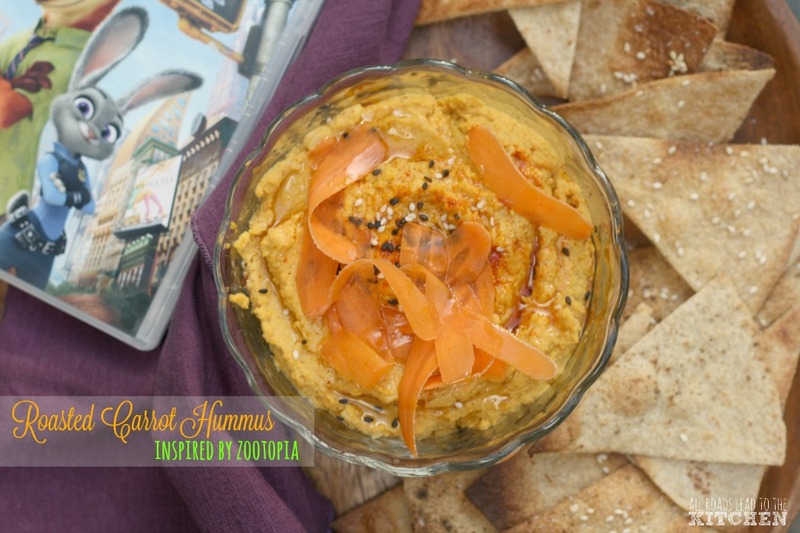 Every month or so, my friend Kimberly from Coffee and Casseroles and I challenge ourselves to create a recipe from a certain theme; this month she set forth the challenge of "any Disney movie". That's like, a million movies or so. I narrowed it down to a small handful of favorites that included The Aristocats, James and the Giant Peach, Bridge to Terabithia, Spirited Away, The Game Plan, and...Zootopia. Obviously I chose to make something inspired by the latest of those releases. The kids and I went to see Zootopia on opening weekend at theaters—and I LOVED IT. I thought I'd like it, but I didn't expect to come out thinking that surely it was one of the best films of 2016. I know the year is only halfway over at this point, but I still believe that. If you haven't seen it yet, it's set in a world populated by (walking, talking) animals. Instead of aspiring to work on her family farm (which grows carrots, among other things), young Judy Hopps dreams of becoming the very first rabbit police officer when she grows up. In a world of predator and prey, the predators are the cops of this world...until Judy graduates top of her class from the police academy and is placed in the 1st precinct, in the heart of the city. To her dismay, she's placed on meter maid duty. After witnessing a crime and pursuing the criminal, she stumbles into a crime ring that runs much deeper than anybody could have imagined. The formerly peaceful union between the predator and prey of Zootopia is rocked when predators start to turn savage. Judy teams up with a fox conman named Nick to get to the bottom of things. That's a very basic introduction to the film, but I'll let you watch it to see the whole story for yourself. Really, watch it. There are deeper life lessons such as prejudice, bigotry, and stereotypes addressed, but most of all, there is humor. I laughed out loud many times. There were a bunch of "hidden" references or easter eggs throughout, my favorite one being a nod to Breaking Bad. But was there food? Let's just say that aside from the food actually shown on screen like a tv dinner, popsicles, pie, blueberries (and Night Howler flower concentrate made to look like blueberries), and donuts, there is infinite inspiration to be had from the Hopps Family Farm and the many veggies they offered alongside an abundance of carrots. Oh, plus Nick's nickname for Judy was "Carrots" and she had an awesome voice-recording carrot pen. So, today I went with carrots. 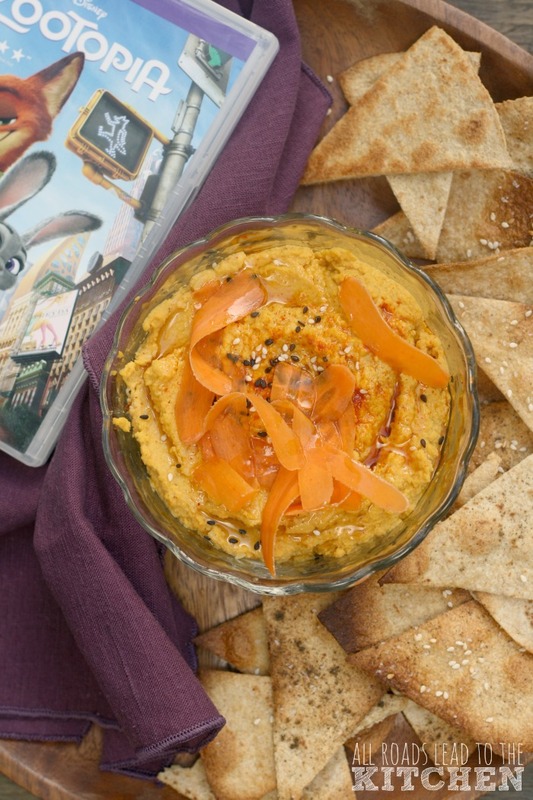 This hummus is something that would be Mr. and Mrs. Hopps-approved. Maybe they should even make it and sell it at their farm stand. Curious to see which Disney flick Kimberly chose and what she made inspired by it? I am! You can check out her post here. 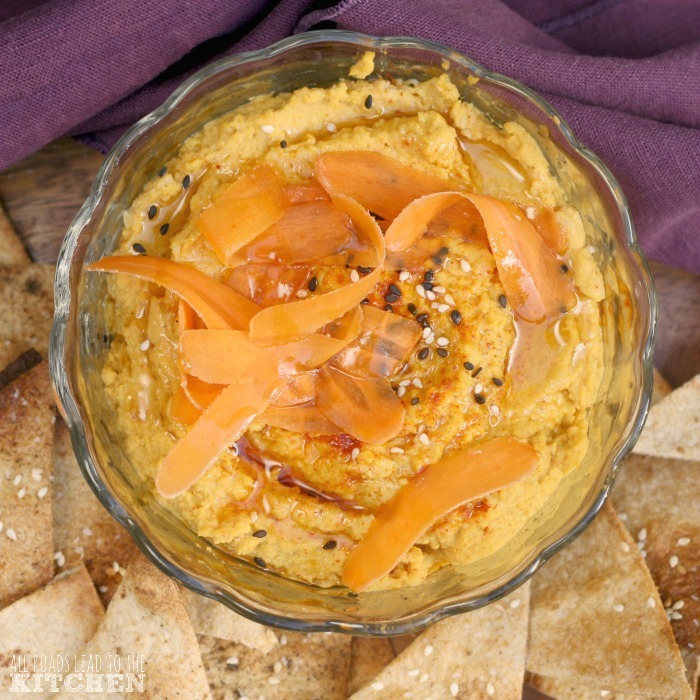 Roasting intensifies the sweetness of carrots that are then blended with garbanzo beans and spices to make a delicious twist on hummus! Preheat oven to 400° F. Line a baking sheet with foil or parchment paper. 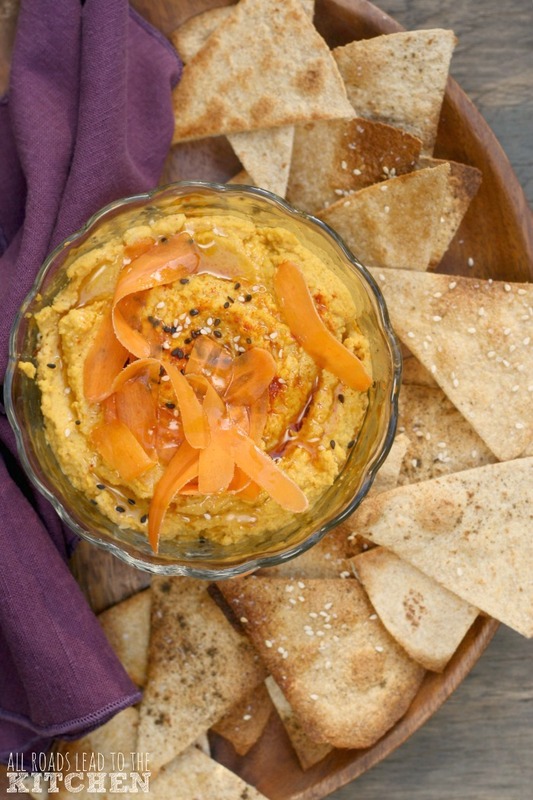 Place the carrots and unpeeled garlic cloves on the prepared baking sheet and drizzle with just enough olive oil to toss and thinly coat (1/2 teaspoon or so). Slide into oven and roasted until tender and browned, ~20 minutes. Let sit 15 minutes. Squeeze the garlic out of the skins and place it and the carrots into the bowl of a food processor with all of the remaining ingredients. Process until smooth and creamy, drizzling in a bit more olive oil or water to adjust consistency to your liking, as needed. Scrape into a bowl and drizzle and scatter with as much of each garnish as you like (it doesn't take much).